So I thought it might be useful to put together a crib sheet. I’m probably missing some stuff, and for all I know some new big lie will have been tweeted out by the time this is posted. But we do what we can. So here we go. This is a Trump special. Each time, fact-checkers have piled on to point out that it’s false. Here’s taxes as a percentage of GDP, from the OECD. But why does Trump keep repeating what even he has to know by now is a flat lie? I suspect it’s a power thing: he enjoys showing that he can lie repeatedly through his teeth, be caught red-handed in his lie again and again, and his followers will still believe him rather than the “fake news” media. Advocates of estate tax repeal haven’t been able to come up with a single example at least since the late 1970s, when exemption levels were raised to the equivalent of around $2 million in today’s dollars. Lately Trump has added a new twist, portraying the estate tax as a terrible burden on hard-working truckers. For who among us doesn’t own an $11 million fleet of trucks? 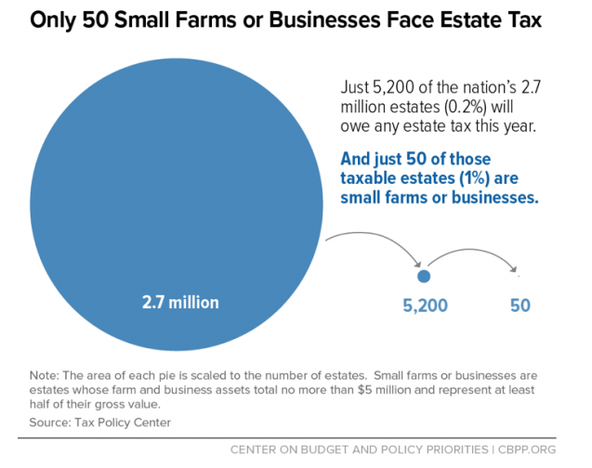 The reality, as this graphic from the CBPR shows, is that only a small number of very large estates pay any tax at all, and only a tiny fraction of those tax-paying estates are small businesses or family farms (it seems quite possible that this year only 2 or 3 truckers and not a single farmer will pay any estate tax). Trump wants to change that, and let owners simply pay a 25% tax on the earnings of pass-through entities, with no further taxes owed. This is being billed as a reduction in the burden on hard-working small business owners. But as the Tax Policy Center explains, many middle-income households who own pass-through entities aren’t running businesses; they generally derive only a small fraction of their income from these entities: «Rather, they may receive occasional income from the rental of a vacation home, or from the sale of odds and ends on eBay, that they report as business income». High-income owners of such entities, by contrast, get a lot of money from them – but they’re not struggling small business people: «This high-income group is made up of doctors, lawyers, consultants, other professionals, and, at the very highest end, partners in hedge funds or other investment firms». And these are, of course, the people who would gain massively from the Trump proposal. They’d also have a strong incentive to rearrange their affairs so that more of their income pops up in their pass-throughs. This wouldn’t be small-business creation; it wouldn’t add jobs; it would just be tax avoidance. That’s what happened when Kansas tried something similar, and played a big role in the state’s fiscal disaster. Think about what happens if you cut the taxes on corporate profits. The immediate impact is that (duh) corporations have more money. Why would they spend that extra money on hiring more workers or increasing their wages? Not, surely, out of the goodness of their hearts – and not in response to worker demands, because these days nobody cares what workers think. A lot of profits aren’t a return on physical capital and won’t be competed down if capital gets cheaper. Apple, Google, Microsoft, and others derive their profits from technological advantages, brand name, and market power; cutting the taxes on those profits just leaves their owners with more money (see here for more on taxing the internet companies). To raise wages a tax cut must raise the overall stock of capital, which means it must lead to higher total investment spending. Where does the money for that increase in investment come from? The tax cuts are unlikely to raise national saving. The money might come from abroad, via capital inflows. But here the flip side would be a bigger trade deficit – hardly what the proponents of tax cuts are advertising – and in any case running trade deficits on the required scale is a much more problematic thing than people seem to realize. The dollar would have to rise sharply – and the strength of the dollar would itself deter foreign investment, very much slowing the process of wage rise. And we have solid empirical evidence here. In 2004 the U.S. enacted the Homeland Investment Act, which offered a tax holiday for repatriation of foreign earnings by U.S. multinationals. Repatriations did not lead to an increase in domestic investment, employment or R&D — even for the firms stating these intentions and for firms that appeared to be financially constrained. Instead, a $1 increase in repatriations was associated with an increase of almost $1 in payouts to shareholders. Major provisions of the Unified Framework: (i) Cuts in corporate taxes; (ii) Pass-through tax cut; (iii) elimination of the estate tax; (iv) cut in top marginal rate. All these strongly favor very high incomes. This is what the Tax Policy Center estimates. See Lie #6 above. What’s left is mostly small change – and some of it, like ending deductibility of state and local taxes and other deductions, actually raises taxes on a substantial number of middle-class Americans. 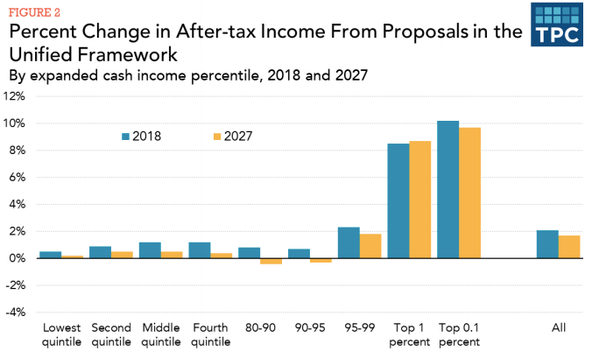 In total, by 2027, according to TPC, 80% of the tax cut goes to the top 1%; only 12% to the middle three quintiles. The only answer would be if the tax proposal eliminated vast swathes of the existing set of tax deductions, massively broadening the tax base. It doesn’t. The only even halfway biggish thing here is the state and local deductibility end – and that is already in very big political trouble. This is a multi-trillion-dollar budget buster, unless it summons up deep voodoo. Insistence in the magical power of tax cuts is the ultimate zombie lie of U.S. policy discussion; nothing can kill it. And we know why: there’s a lot of money behind the proposition that great things will happen if you cut the donors’ taxes. Still, for the record: Reagan cut taxes, and although his administration began with a terrible recession, there was a fast recovery thereafter. Some of us think Paul Volcker had more to do with both the recession and the recovery than anything coming from the White House (see here, here, and here); but in any case we have more evidence.